Because we started yesterday (our trip to Hiroshima) so early, I wanted to get a good rest and sleep late today. 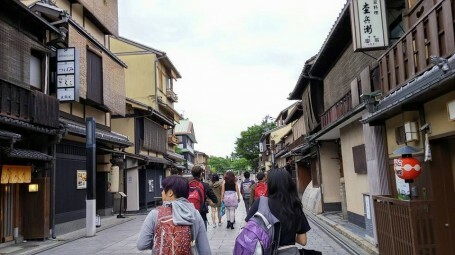 So, by the time I’d gotten up, everyone else had already checked out of their rooms and started exploring Kyoto. 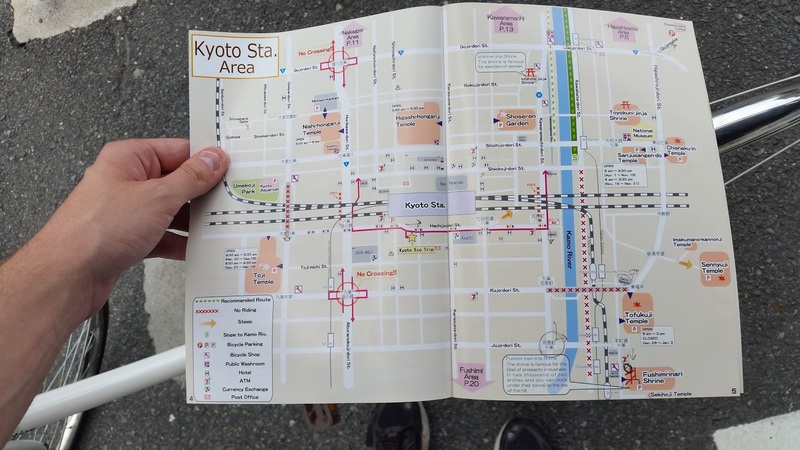 I heard from Matt, an alumni of the program, that there are plenty of bike rental shops around Kyoto station, so I decided to give my feet a rest and bike everywhere today. After paying for the one-day rental and stocking up on water, I used the simplified tourist maps to proceed to get completely lost only minutes after setting out. It’s not that the maps were wrong per-se, but they omitted some very important details (read: roads) that meant that if I ever got off of the map, it was nearly impossible to find my way back onto it. I ended up navigating using Google maps for the whole day, only consulting the map to make use of its extensive bicycle parking directory. 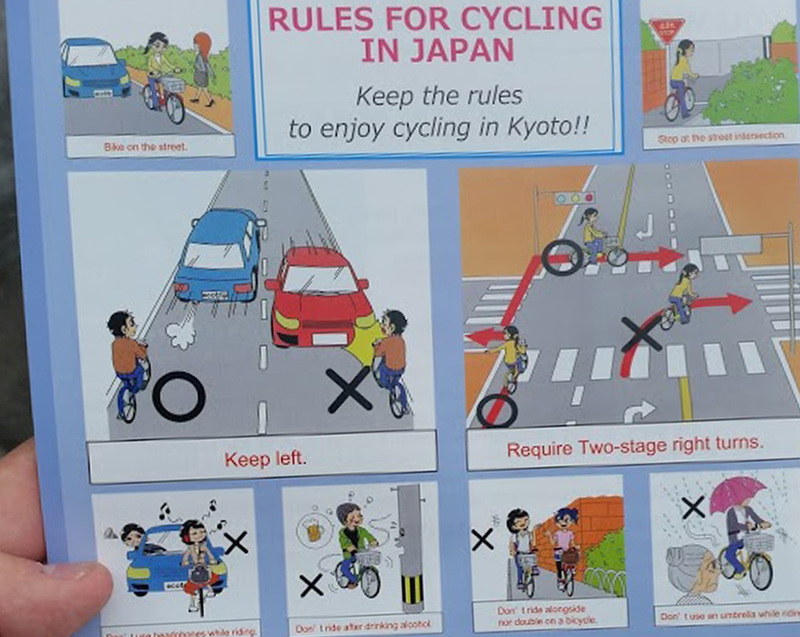 Helpful rules for getting accustomed to riding in Kyoto; over the course of my day I watched locals break almost all of them. 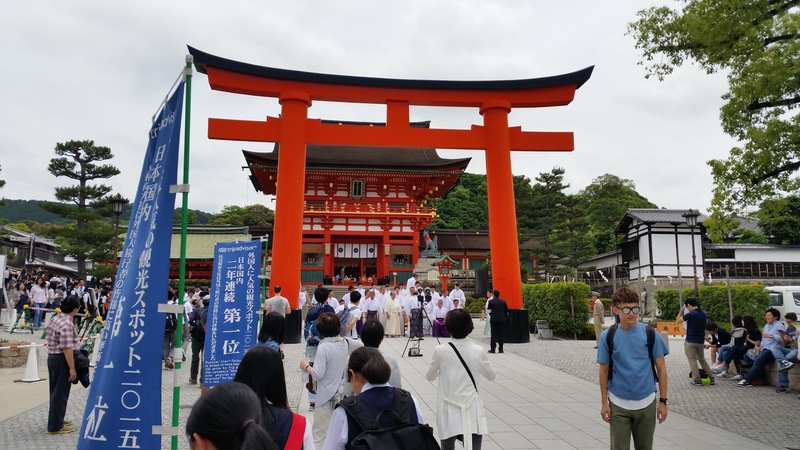 The first place I visited was Fushimi Inari-taisha (the shrine of one thousand torii). The entrance and main shrine were magnificent, but packed with people, making it hard to take in the calm majesty of the torii, each of which was donated to the temple as thanks for its donor’s business success. Trying for the perfect picture against all odds. As soon as I could, I took a side path that jutted off from the main avenue of people, leading to a secluded and almost abandoned trail up the East side of mount Inari. It didn’t have the titular torii of the main trail, but the calm quiet of the bamboo forests and intricately detailed shrines offered something else, a bit of peace from the bustle of the cities I’d been living in for the past two weeks. Almost every one of these was equipped with an unmanned store at the front (this being Japan, they weren’t worried about anyone stealing anything). At one, I think I may have arrived during the middle of a prayer or ceremony, based on the faint chanting and “do not enter” sign placed halfway along the walkway. Eventually, after many gratuitously expensive vending machines and quad-destroying switchbacks, my trail joined back with the trail of torii towards the summit. It seemed very few people were committed to reaching the top, so it was just as empty as the backwoods trail had been. There weren’t any spectacular views (at least not from the summit), but the shrines (and accompanying gift shops) at the highest point were magnificent and worth the trip. On the way back down, I took the main trail and experienced the conventional Fushimi Inari-taisha experience, but backwards. 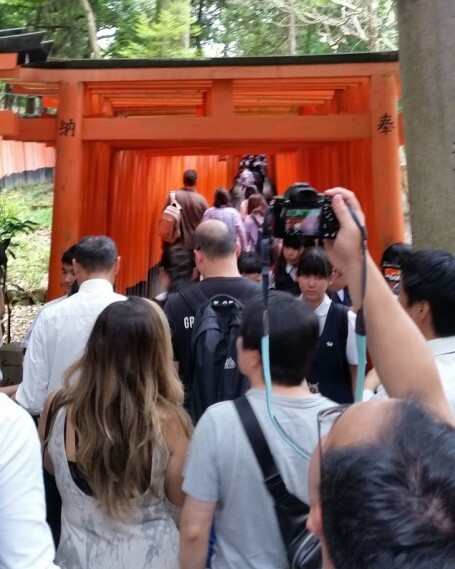 Instead of gradually escaping the crowds and seeing the torii in their uninterrupted beauty, I progressed further into the crowds and aggressive shop owners as I traveled back down the mountain. Overall, I see this as an situation where I tried to avoid the well-beaten path, and got rewarded with some unique experiences for my troubles. At this shrine, all I found were sandals at the entrance, accompanied by the sound of pouring water, chanting, and singing coming from behind the “do not enter” sign. The most delicious tofu I’ve eaten in my entire life. Back on my bike, I traveled to Yasaka shrine, where I ate at a restaurant that only serves one order, a course of the most delicious tofu I’ve ever eaten in my entire life. Three different styles of tofu came together to form a complete flavor experience, complete with sweetness, savoriness, and richness, all from tofu! 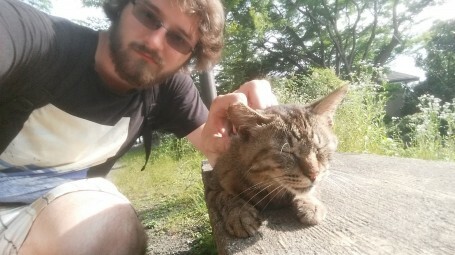 After that, I was planning on biking along the Philosopher’s Walk (a secluded riverside path lined with cherry trees), but I was waylaid by cats from a local cat cafe. They were way friendlier than I’d experienced from other cat-cafe cats (even when they’re on the clock!). By this point, I was already pushing it in terms of getting back to our hotel by the scheduled meeting time, so I wasn’t able to take any more pictures in my mad dash back to central Kyoto. 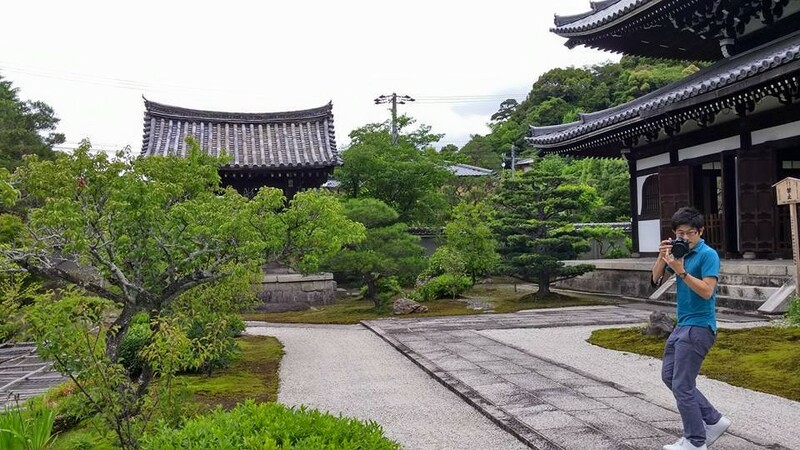 In the end, between visiting shrines and other tourist hotspots, as well as biking through the streets and narrow alleys of Kyoto, I feel that I got a good mix of both the tourist and local experiences in Kyoto. Here we see the Vincent in his native habitat, struggling in vain to understand how selfies work. Today has been fantastic! 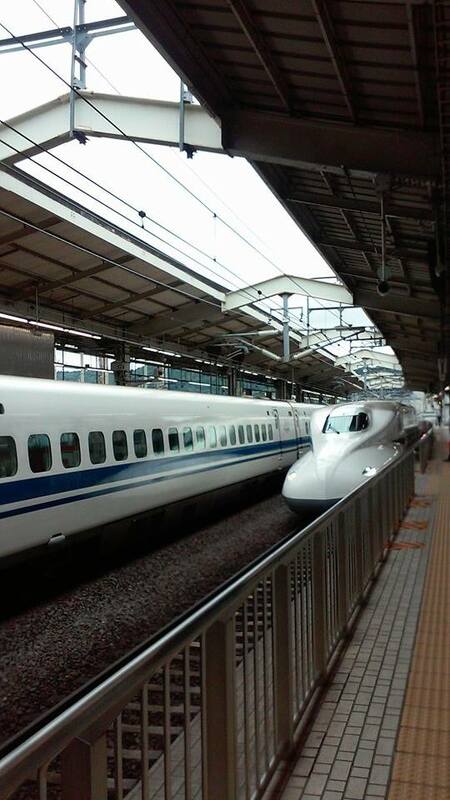 We took a bullet train (officially called the Shinkansen) to Kyoto, for our second excursion out of metropolitan Tokyo. It was my first time, as well as many other peoples’, and we reached speeds of up to 150mph. 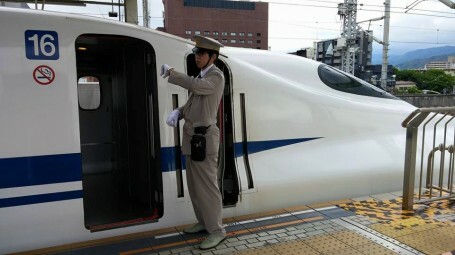 The entire ride took about two and a half hours from Tokyo to Kyoto. After arriving, we dropped off our luggage at the hotel, conveniently located across the street from the train station, and headed toward Kyoto University, the second best rated college in Japan. There, we met with USC alum and former student of Lon-Sensei, Tokunaga-san, and discussed the idea of a transpacific identity. 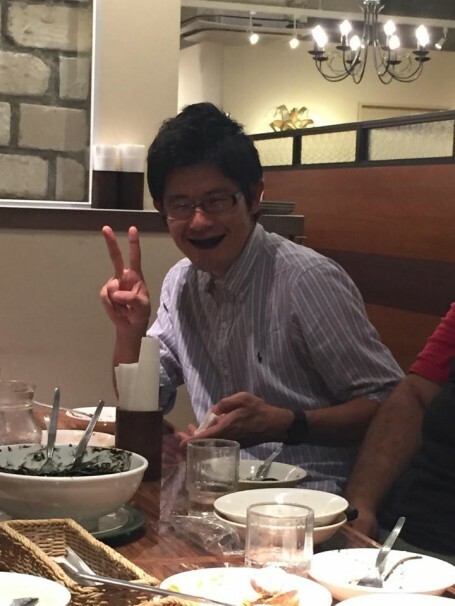 Toku-san was raised in Kyoto, and has a long lineage of Kyoto University attendants and professors in his family. 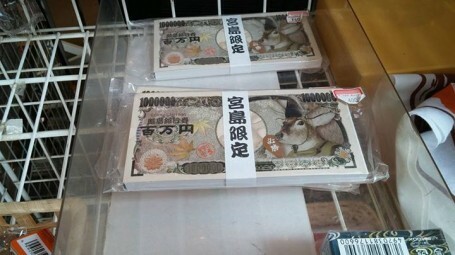 Therefore, his identity is somewhat rooted in Kyoto. However, he also spent years at USC as a PhD student and had his first child there. Through discussion, we explored what it means to embrace two or more cultural and geographical identities. 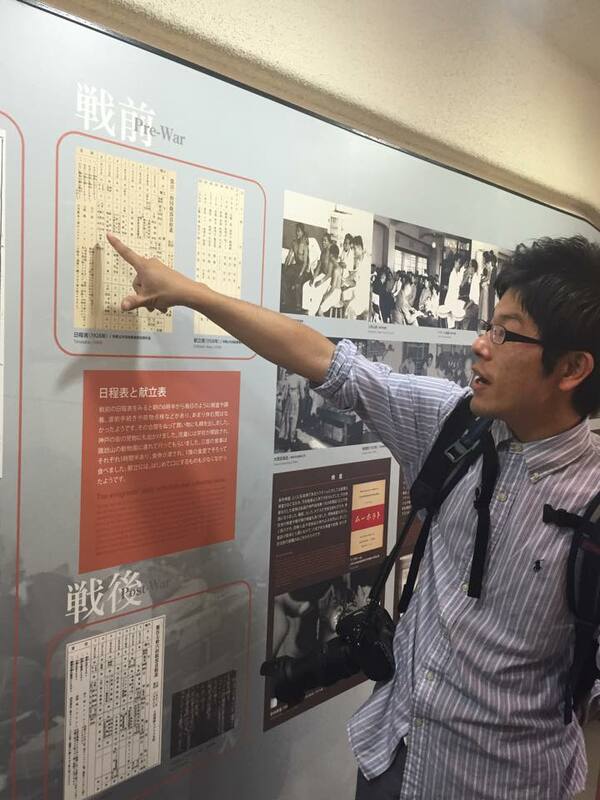 Next, he took the group on a tour through Kyoto University, and talked about the school’s history with activism. Student activism at the university is very liberal, but it is not as popular as it once was. We encountered one person sleeping in a makeshift home with pots and pans and clothes outside, as a sign of protest. 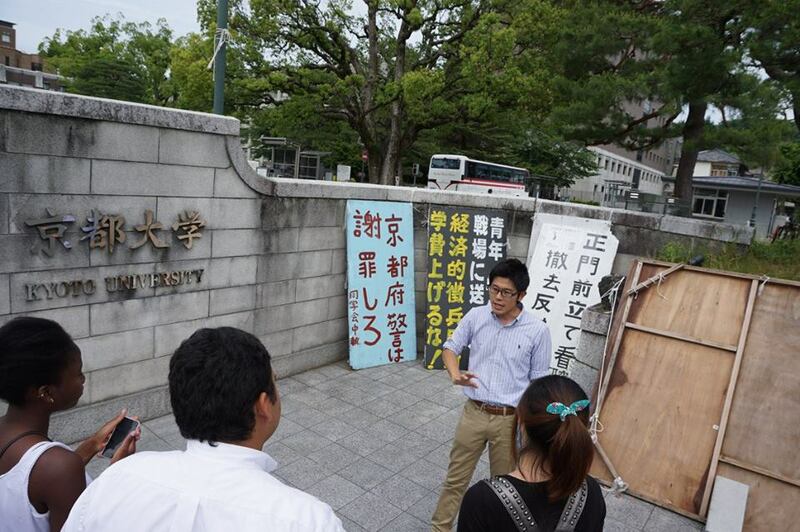 Though the ability to protest in such a public manner was available, many students did not engage in it this way. 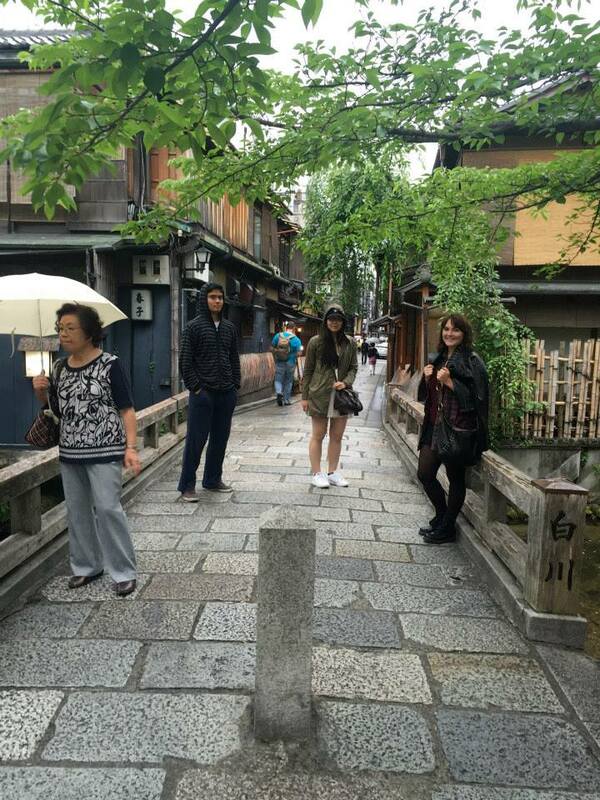 After the tour, we arrived at Kiyomizu-Dera, a historically preserved place in Kyoto. The styles of the homes, shrines, and streets were the same as those from hundreds of years ago. We walked along the famed temple path, looking at handcrafted souvenirs and consuming frozen treats along the way. After walking through a section of the temple, we arrived at a location where we all had the chance to purify out mouths and hands before continuing through the temple. The process involved using a wooden ladle to retrieve water and wash both hands and then scoop some water into the mouth. For many, it was a first experience. We then walked away from the temple and explored the surrounding area. We saw the statue of Kannon, a well respected Bodhisattva. 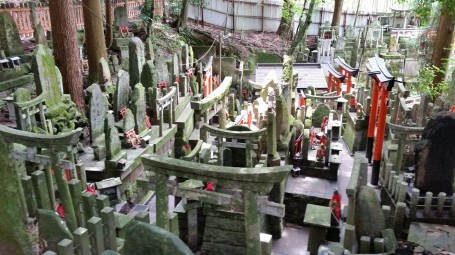 We also came across many temples and shrines, including one dedicated to geishas. Throughout the day, we encountered many ordinary people who wore kimonos on their journey through the area. 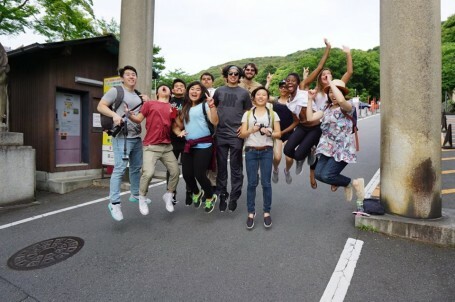 We learned from our Teaching Assistant Rio-san, that, many people do this as a way to connect and be a greater part of the traditional environment. 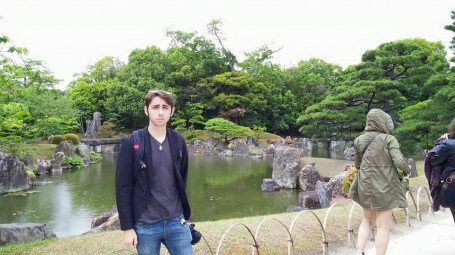 Soon after, we settled at a park at the edge of downtown Kyoto. There, we hung out by the river. The location is known for local artisan goods and its restaurants. College students also frequent there during the weekend, creating a social and relaxed environment. 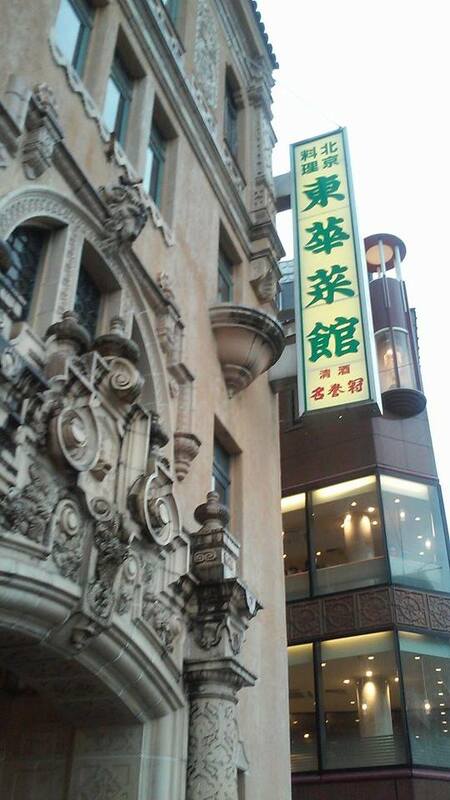 Finally, we went to a traditional Chinese restaurant in the area. There, we enjoyed traditional Chinese dishes of egg fried rice, fried eggplant, and spicy fish soup, among others. The day was filled with a lot of cultural and historical excavations. 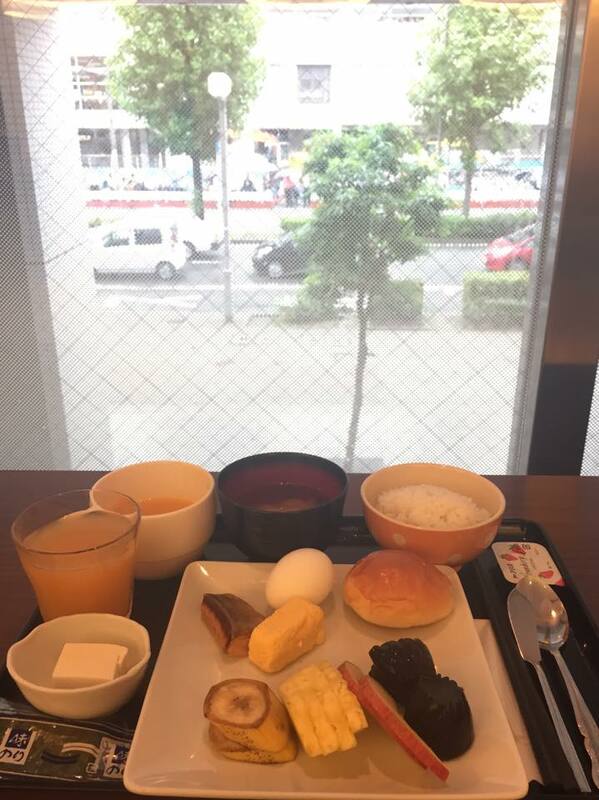 Good morning Kyoto! Today June 11 is our last day in Kyoto and we have free time until 12:45 pm. A lot of us broke up into different groups. 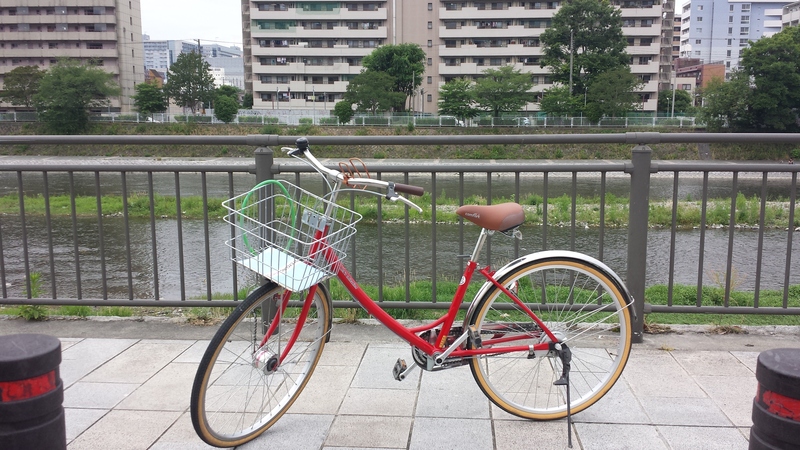 Some of us went to the arcade, others went shopping in the malls near Kyoto station, and I decided to rent a bike and ride down the Kamo River. The bike shop was just around the corner from the our hotel and the rates were really good. It cost me about $8 to rent a bicycle for a day. Going to the river is very easy because you just have to head in the general direction of the river until you see it. Almost every bridge has stairs or slope for people or bicyclists. I only had a limited time to ride on the river plain so I decided to head north because I was told it had beautiful scenery. Here we go! I cruised along the Kamo river on this bicycle. When I got to the river I noticed that the river plain was clean just like Kyoto and Tokyo. I found it very nice that we can find areas with nature, even though we are in a big city. The river plain was very pleasant and serene. It wasn’t very crowded this Friday morning, but I saw some people eating, chatting, and sleeping along the river. There were many ducks, swans, and cranes along the river enjoying their day as well. This scene reminded me of the scenes in Pico Iyer’s The Lady and the Monk when Iyer would walk with Sachiko in the beautiful and serene parks in Japan. Experiencing Japan’s nature in real life helped me grasp Japan’s respect for nature. In each place we have visited, mankind has coexisted with nature. As Iyer described in his books, Japan’s respect for nature is beautiful. 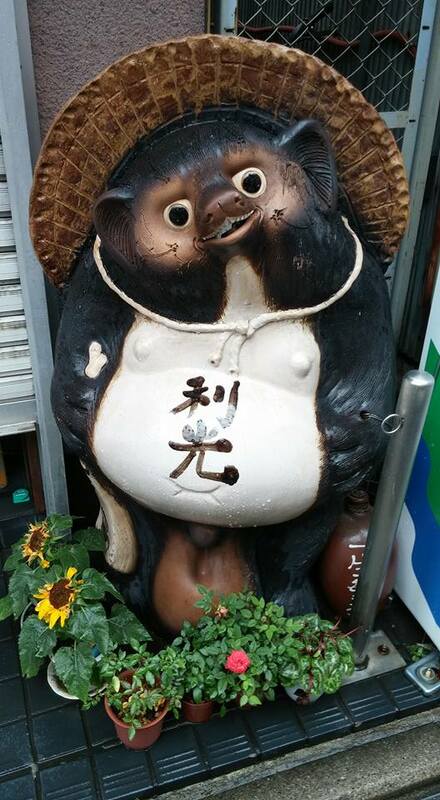 Perhaps the Japanese respect for life and others stems from their respect for nature which can be seen everywhere in Japan if you know where to look. 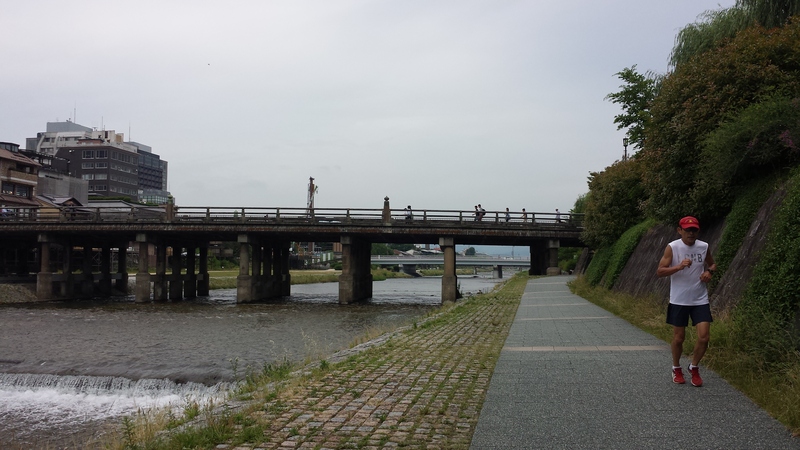 The river plain by Kamo river was serene and beautiful. There was lots of wildlife and many people jogging, eating, chatting, and resting along the river plain. If I had more time I would do all of that and more along the river! I had to get back to the hotel at 12:45 pm, but got lost on the way back because all the bridges that connect to the street look the same. 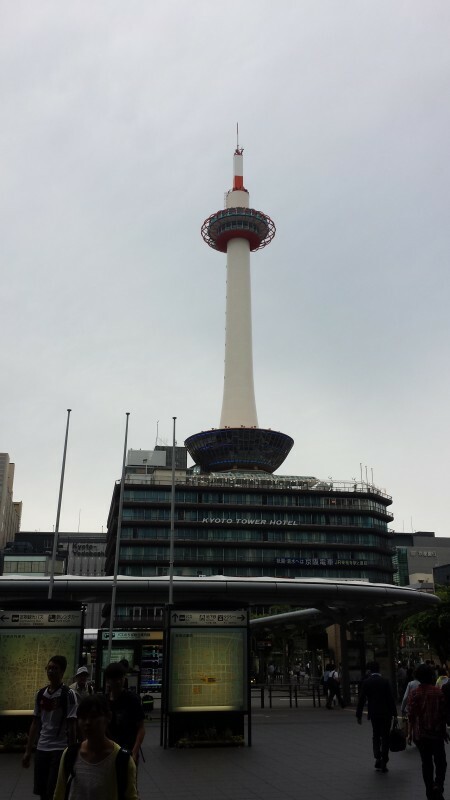 Luckily Kyoto tower is a major land mark by our hotel. I went down the river until I was near the tower that looked like a giant daikon. I arrived safely and on time. Bye Kyoto, thanks for all the good memories! The ride back to Tokyo took about 3 hours, so many of us got some good rest and sleep. Kyoto Tower is a major landmark near Kyoto station. To me it looks like a giant Daikon. 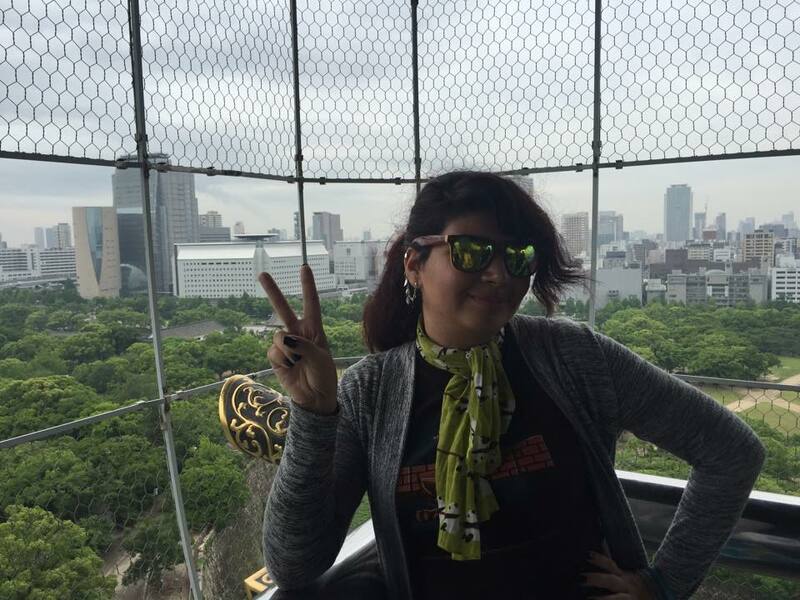 I got lost a little bit but thanks to Kyoto Tower I was able to get back on time. When we got back to our home in Jimbocho Sakura Hotel, some of us went out to dinner with the Meiji students while some of us (myself included) decide to stay in the hotel and get some rest. Later that night Andi, Chris, and I headed out to Ikebukuro to go to the legendary Penguin Bar. Going to Ikebukuro station was easy, but finding the bar was a little bit harder. We got lost, but we found a lot of interesting things. 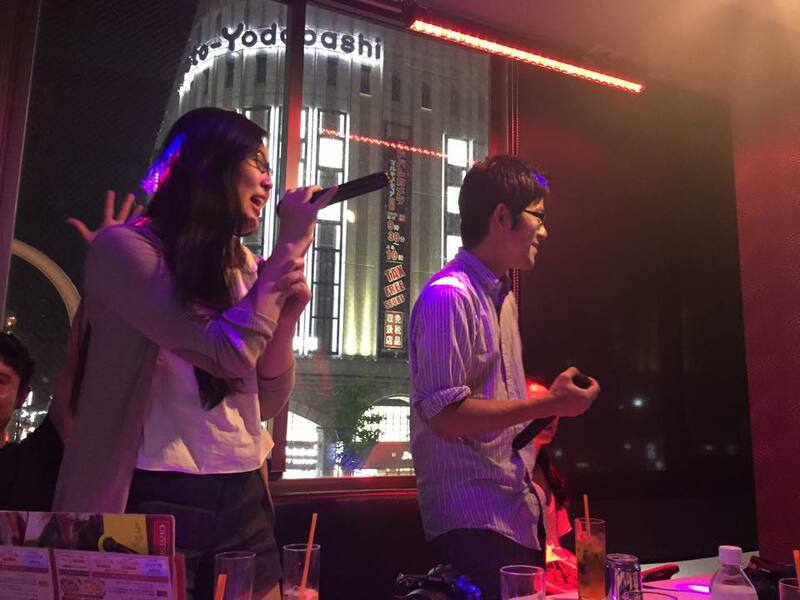 Ikebukuro has a very interesting night life. There were many other young people looking for fun, host and hostesses advertising for their restaurant or club, and the fabled love hotels we have heard about. There were also many restaurants with delicious looking food around us. We went to a very busy ramen shop and ate some very delicious ramen. Nearby was a Don Quijote (a mega store chain in Japan that sells many cheap items) so we stopped by after dinner. 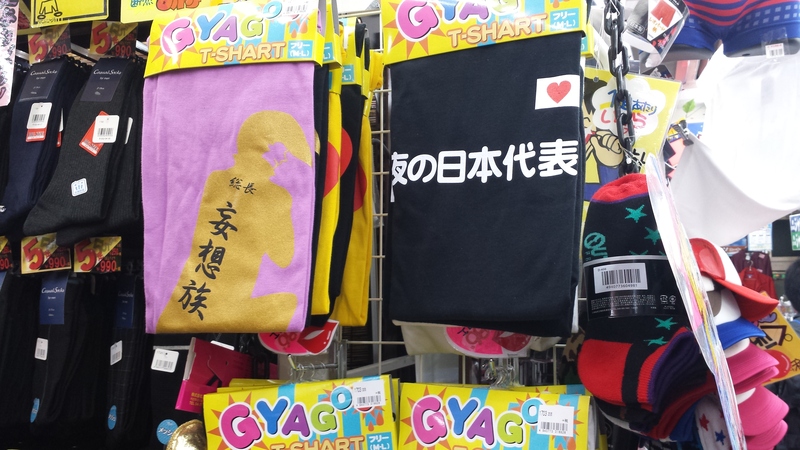 While the ladies were looking around I was looking at Japanese gag shirts. I was really surprised to see that the Japanese also had their own versions of gag shirts. This goes closely with my research which is on western symbols and phrases on Japanese T shirts. What I noticed on Japanese gag shirts, is that most of it is written in Japanese. 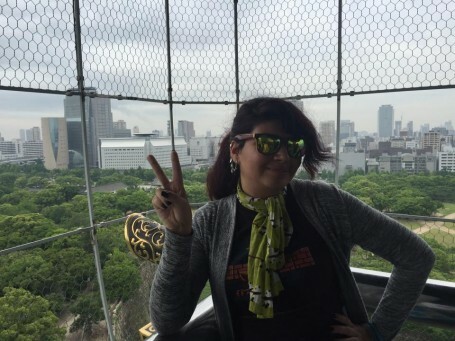 Perhaps shirts that meant to look cool or make a political statement are usually written in English while shirts written in Kanji are worn for humor. The types of gag shirts in the store reminds me of the shirts we find at a gag store in the United States called Spencer’s. 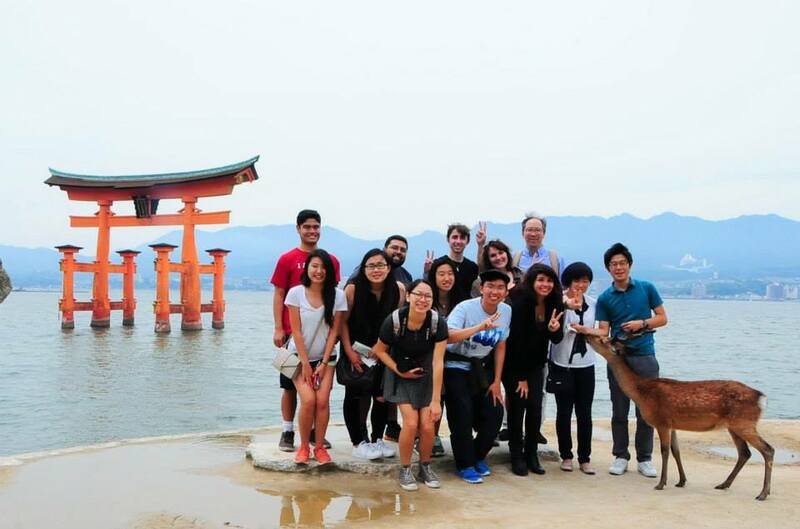 Throughout the trip, I have experienced the same experience as Pico Iyer in his book where he realized that Japan and the west are not so different after all. Here are examples of gag shifts in Japan. They often have a simple design and are written in Kanji. After doing some shopping, the three of us stumbled into a couples’ park. We think it was a couples’ park because there were many couples there and they were showing personal displays of affection, such as holding hands. This was interesting because we did not see many couples showing affection in public. At night there is a lot more freedom and anonymity so young couples like the ones in the park can express their love for each other in public. This reminds me of the concept tatemae and honne as discussed in class. 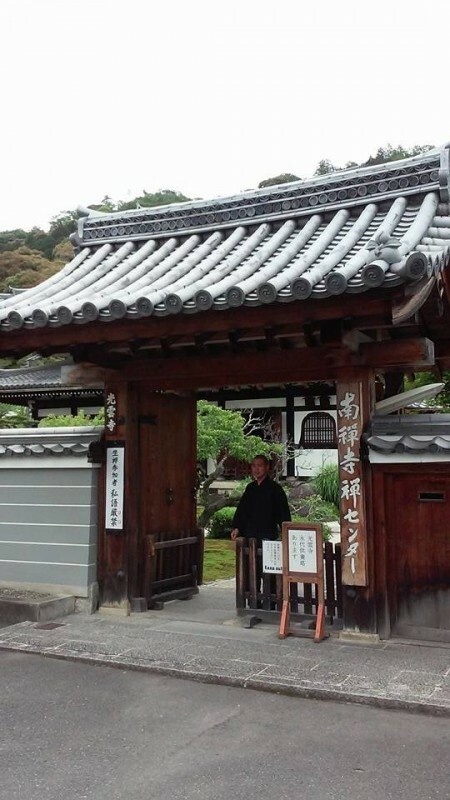 For many Japanese people they have to maintain tatemae and keep a public face by acting like everyone else in society while honne, the true self, is only expressed at home or at night when they are anonymous. It was an interesting contrast to see young people loosening up, enjoying the night with their partner, and being themselves. It got a little uncomfortable watching the other couples in the park so we left for the Penguin Bar. Here is picture of the couples’ park we went to. 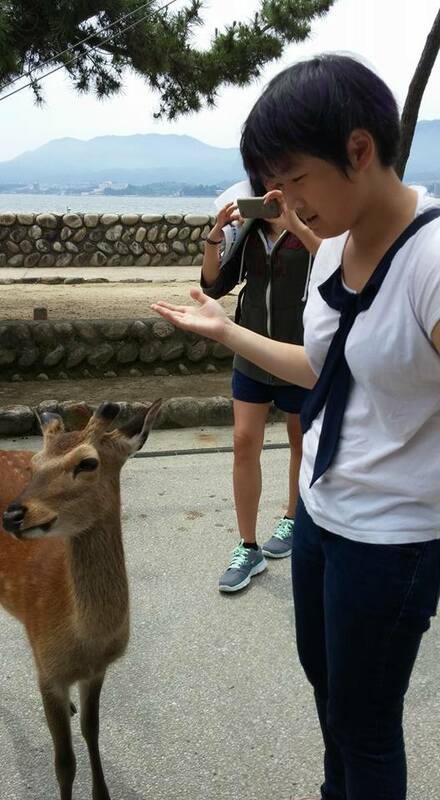 It was a beautiful sight to see tatemae and honne in real life. We originally did not know the directions to the Penguin Bar. 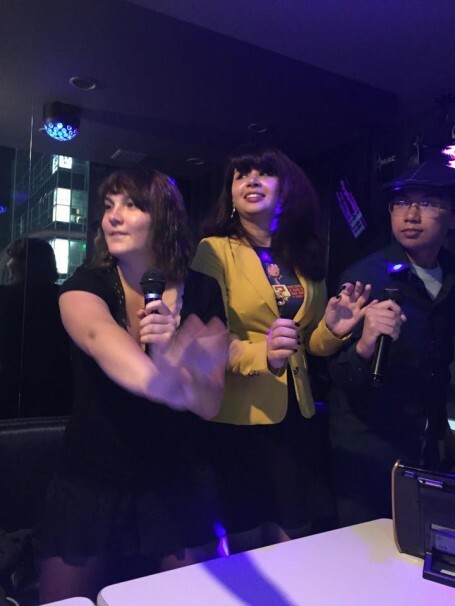 Something interesting was that when we asked Japanese girls where it was, most of them pointed us to the general direction to the bar while men did not even knew it existed. When we arrived, it was clear that this bar is mainly catered to girls and couples. It was a very classy place with waiters and waitresses dressed up in vests that made them look like penguins. When we saw the penguins all of our heart beats jumped; the penguins were very cute. We all took pictures of them and Chris wanted to set them free. It was a very cute and cool bar. 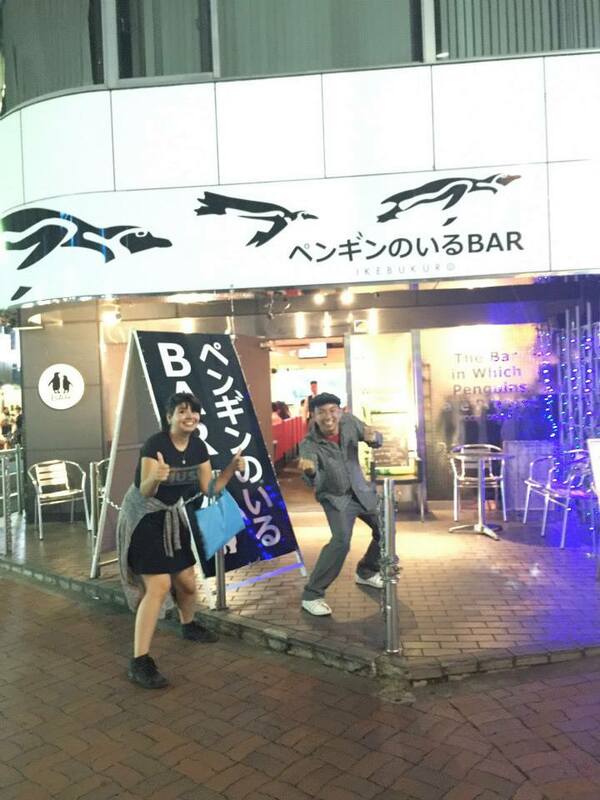 After getting lost numerous times, we were glad to enter the legendary Penguin Bar. We enjoyed ourselves in the bar for a really long time and had “Real-Girl-talk”. 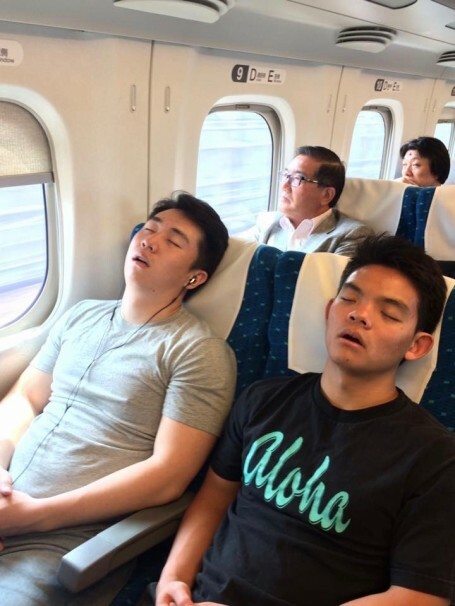 We enjoyed ourselves for so long, that we missed the last train home. It was fine though because there were three of us so it was not expensive taking a taxi home. In total it cost us about $10 each and interestingly this was only the second time we have ridden a car in Japan. 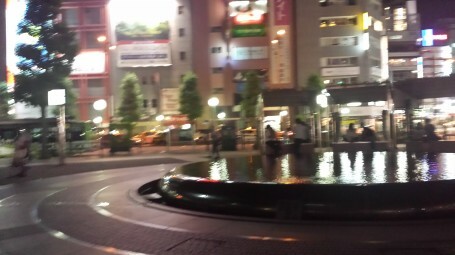 What an amazing night in Ikebukuro. I’m looking forward to getting lost and finding my way with my friends! 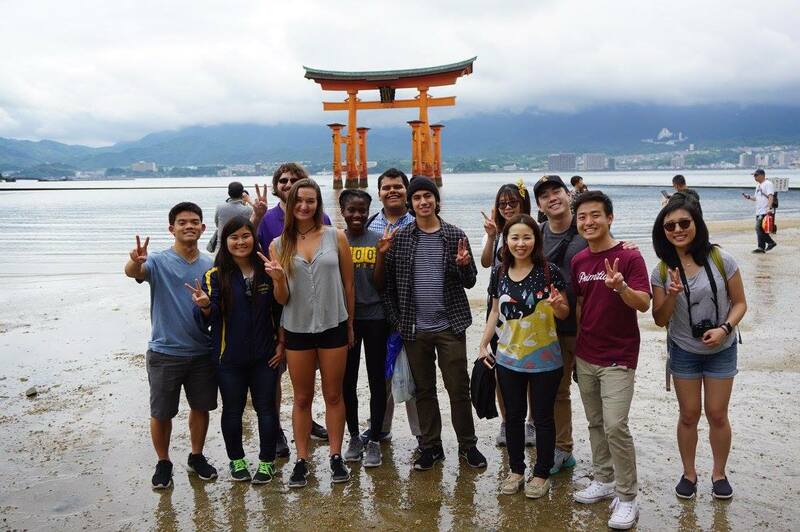 On June 10, we started our day off with a bullet train trip to Hiroshima to learn about how the Japanese teach the story of WWII. We left our bus at Aioi bridge, which was the original target of the first atomic bomb. 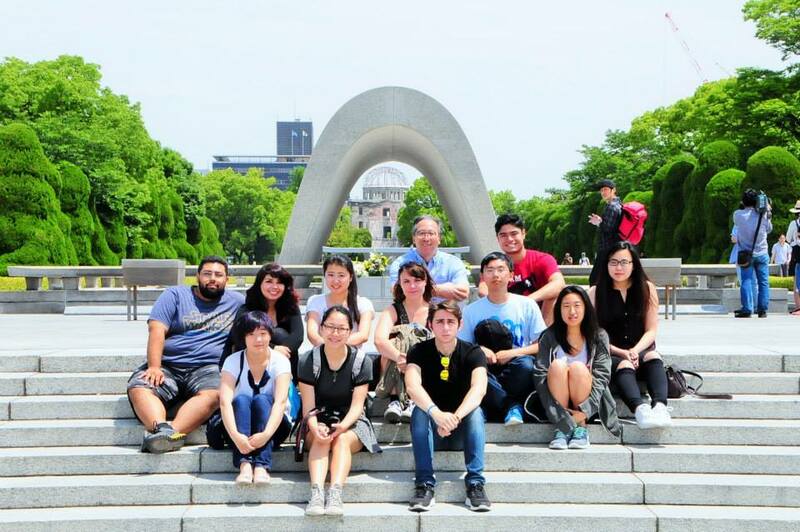 Our tour guide led us to the Hiroshima Peace Memorial, a concrete building which served as a monument immediately after the war. 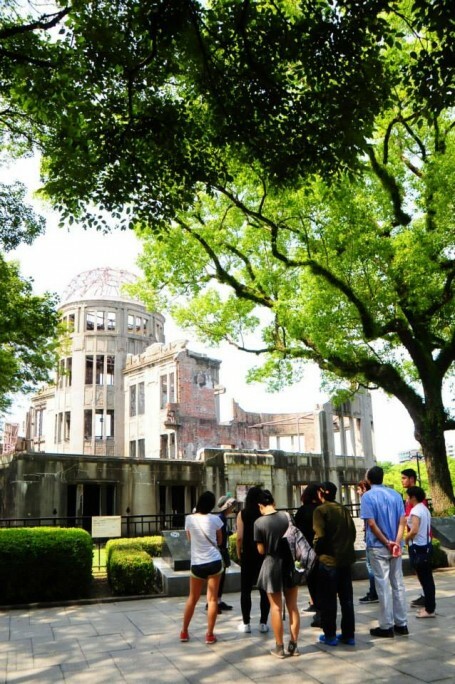 Since most buildings in Hiroshima were made of wood, they were burnt in the initial head of the bomb. One of the few buildings left standing in the area was the one made of more sturdy material. Because much of the city was left in complete ruins, this building, which was one of very few in a large radius, became a spot for friends and family members to search for and leave messages for their loved ones who they lost during the confusion of the wreck. After the memorial, we discussed the lasting effects, both physical and societal, of the bomb. Hiroshima was left hopeless, and to make matters worse, the burst of radiation to its citizens caused longer lasting health problems. One of those affected most notably by radiation was a girl named Sadako Sasaki. As an infant, she was in Hiroshima during the blast, but was unharmed by the initial force. Instead, she grew to the age of 12 before showing any signs of lasting damage. She was diagnosed with leukemia, one of the most prominent side effects of the radiation. While hospitalized, Sadako was told that folding 1,000 paper cranes would grant the folder their wish. So she made it her mission to do so with whatever scrap paper and wrappings she could find around. After reaching her goal, she continued to fold until she no longer had the strength to do so, and eventually passed away. 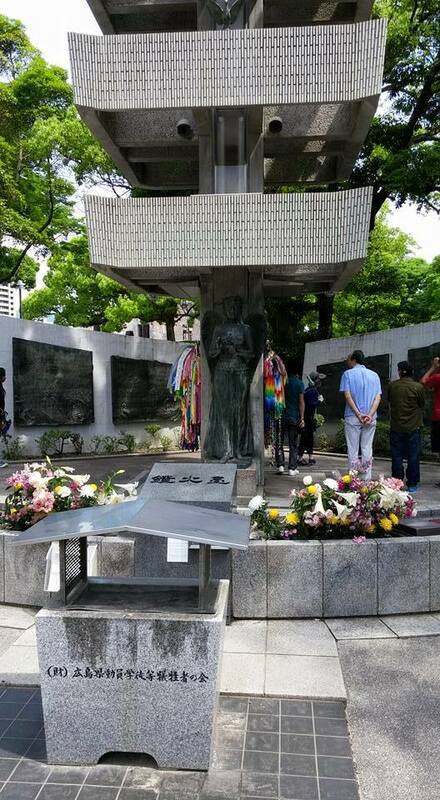 After gaining national attention, Sadako’s story was immortalized through a statue in Peace Memorial Park, and the image of the crane has since then become synonymous with Japan’s desire of lasting peace. Us near a statue of Kannon, the Goddess of Peace, surrounded by hundreds of colorful folded paper cranes. Since my research project is partly based on American influence on Japanese education, being able to contrast how the Japanese and Americans teach the story of World War II in person was extremely helpful. 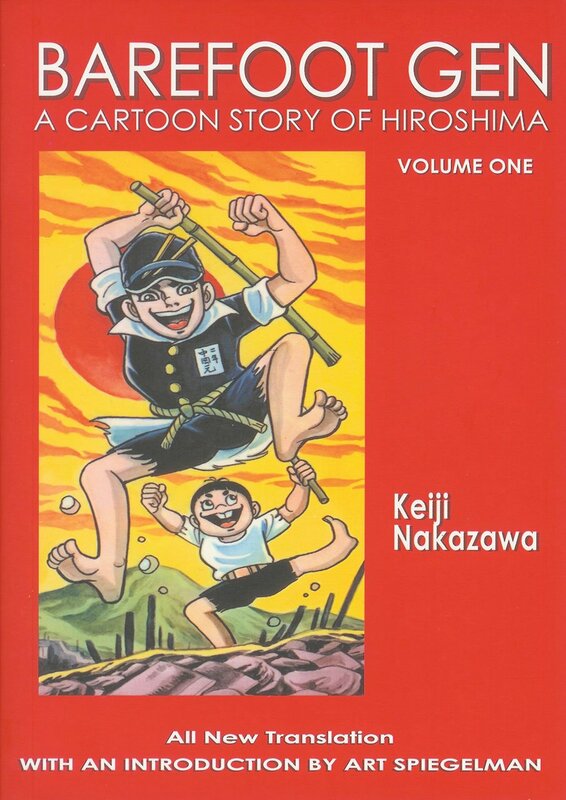 In my experience with American public schools, our war with the Japanese was taught with an “us vs. them” mentality, which led to mixed sentiment both from my history teacher and from the students. It was taught in a very pragmatic and factual way, but the individual details, such as those of Sadako, were never addressed. In addition, the American education system goes over the morality of dropping the atomic bomb, but never conclusively denounces war because it is such a big part of US history. In contrast, Japan talks only of peace in this memorial, rather than addressing the war as a whole. 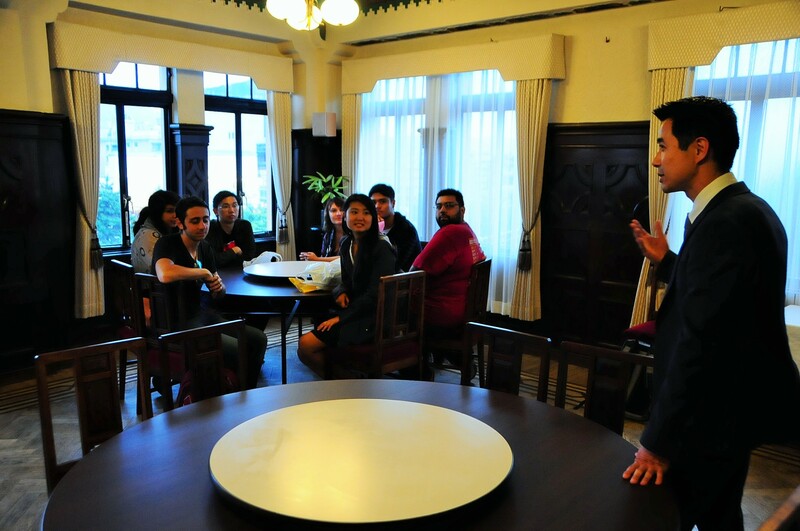 Japan focuses a lot on the stories of the individuals and the emotional aspect. 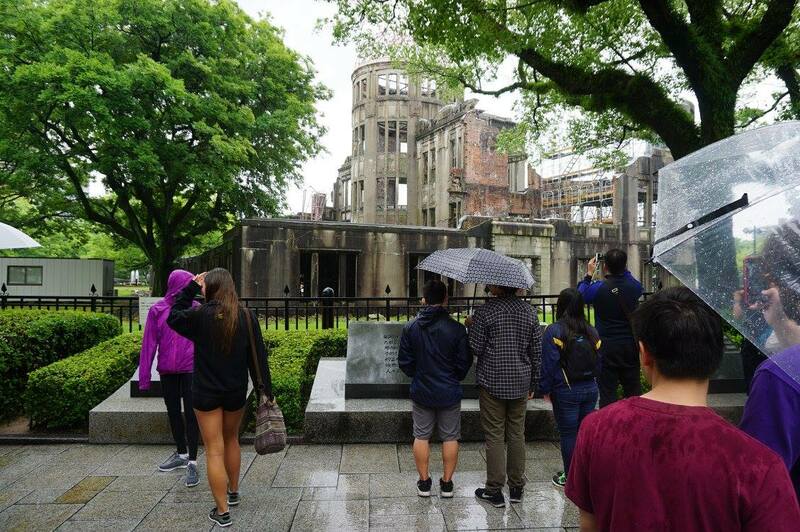 Often when we study statistics like war casualties it becomes easy to detach emotion from the inherent atrocities that war brings, but things like the Hiroshima Peace Memorial help to remind us how tragic each individual story is and how the numbers don’t tell the whole story. 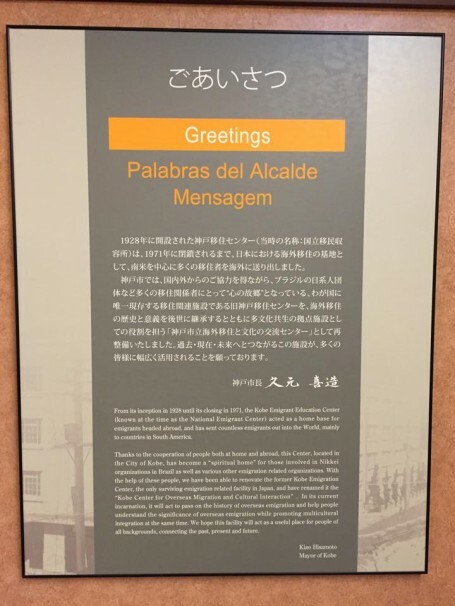 Until visiting the memorial, my project was focused on how Japan has caved to westernization in its education system, so it is nice to see that the teaching of one of the biggest pieces of Japan’s recent history has retained its own Japanese identity and has not changed because of foreign pressure. The second half of our day was a short trip to Miyajima island to get a small window into what life on the islands was like, seeing as there were over a hundred of them. While the first part of the day was much more education focused, this trip was more about enjoying ourselves and exploring our surroundings. One of Miyajima’s most famous features is that it has tame wild deer who roam around the island, so in between getting to hike the surrounding trails, eat traditional maple leaf sweet “momijimanju,” and visit the local temples, we got to play with the deer. This was easily one of our busiest days in the entire trip, having started off in Kyoto, going to Hiroshima, Miyajima, then back to Kyoto for the night, and I can think of no better way to have spent one of our last days in Japan. Today June 9 marks the twelfth day of the trip! Despite having a long traveling day yesterday, we were all still excited to experience two great cities of Japan: Kobe and Osaka. 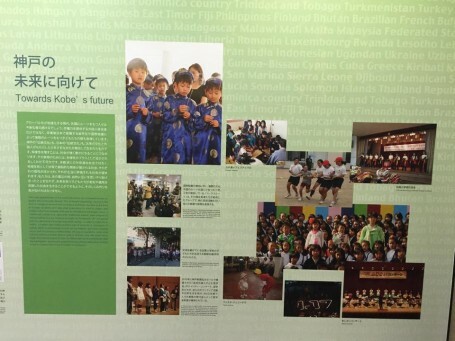 Our experiences in Kobe began at the Kobe Center for Overseas Migration and Cultural Interaction (formerly known as the National Emigrant Center). The site acted as a home base for emigrants before they departed Japan. Today, the center seeks to be both an educator of overseas immigration and a promoter of multicultural integration. 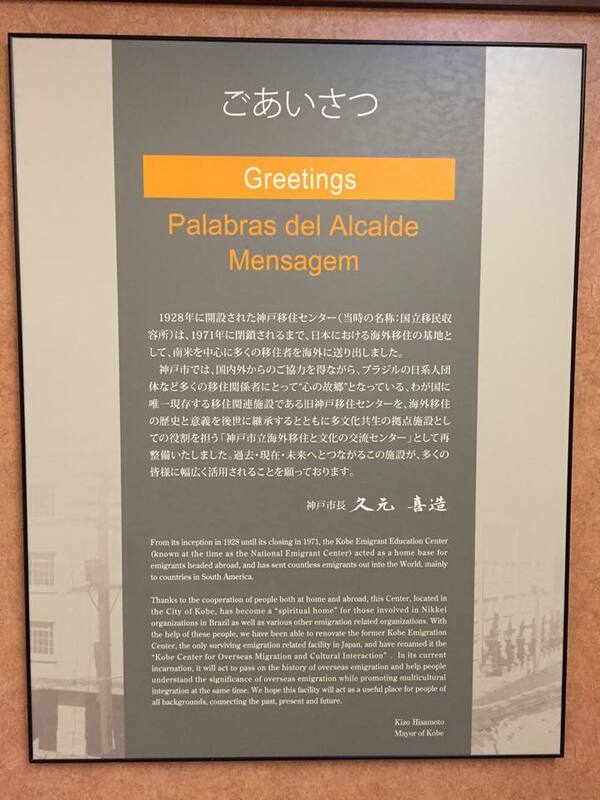 For students like me researching minority groups in Japan, the center provided a great introduction about many Japanese who had left for foreign countries such as Brazil and the historical context for why their descendants and other immigrants came to live in Japan today. Many people living in and outside of Japan are unaware of the diversity of immigrants living in the country. 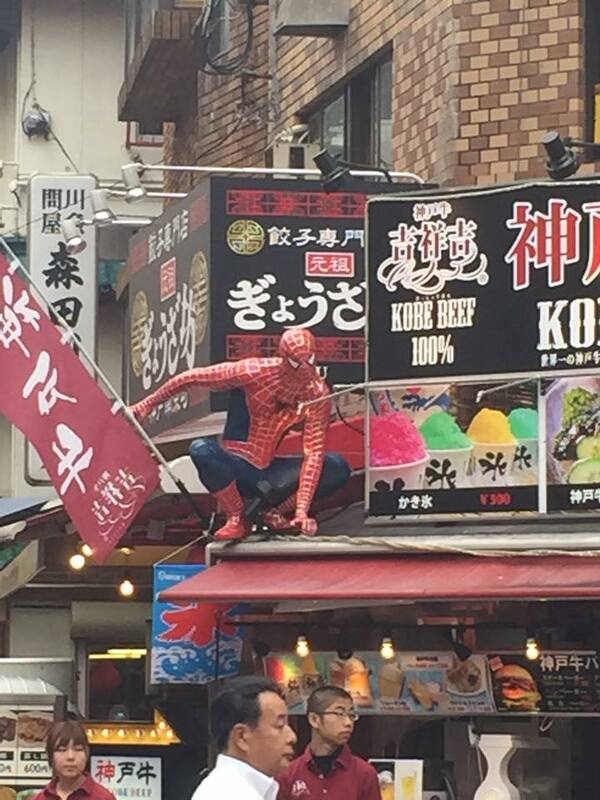 Although Japan is 98% ethnically Japanese, living in Japan are people with ties all around the world. This includes regions like South America, Southeast Asia, China, Europe, North America, and the Korean peninsula. 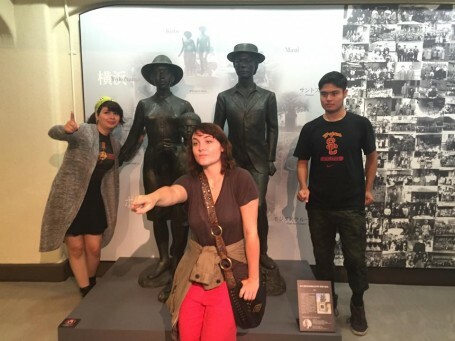 One of the most inspiring aspects about the Center was that it did more than just educate visitors about the history of emigration from Japan to Latin America. 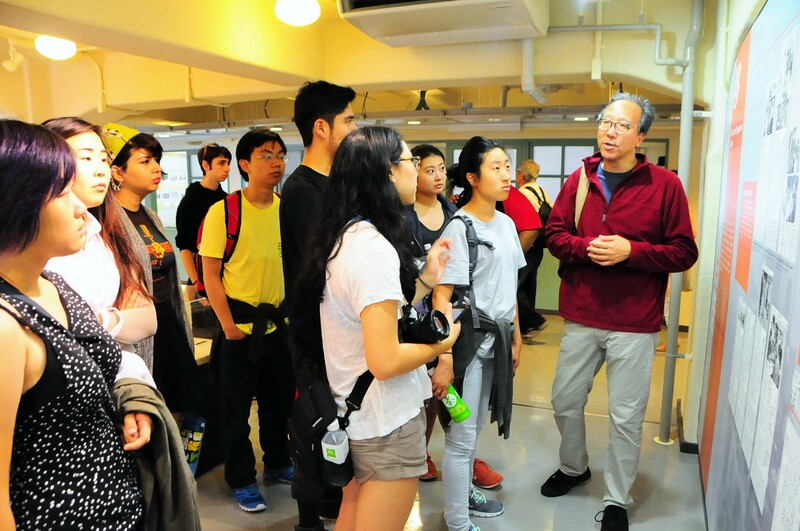 The center pushes visitors to gain an understanding of the past in order to analyze the present and predict future immigration and diversity issues in Japan. For example the center asks visitors to consider how globalization, both from workforce immigration and foreign students staying after graduation to work in Japan, can help create a richer society. It leads visitors to wonder what needs to improve in order to create an environment full of equal and harmonious relationships across all cultural backgrounds. I especially appreciated this aspect of the Center because I have been considering how to fix the mis-perceptions of Koreans living in Japan. Hearing the Center worker’s perspectives on how to mediate these tensions across all different ethnic groups was extremely influential to my research. One of my favorite exhibits of the Center was one that showed the growth of society’s acceptance. Many events have encouraged mutual understandings across different cultural groups. For example, the Kanto Great Earthquake in 1923 culminated in the massacre of many Koreans and Chinese. This tragic chapter in Japanese history reflects the racism and discrimination that Koreans and Chinese had faced for years up until that point. 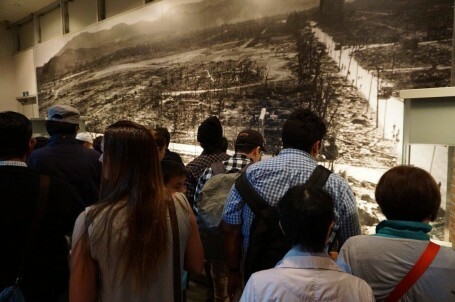 Nearly 72 years later, another devastating earthquake occurred, but ended in many people coming together to overcome the struggles following the event. 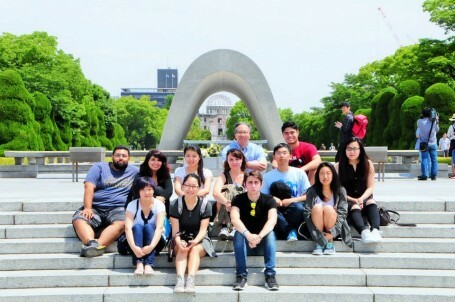 The Center was a great pit stop for our group to gain a greater understanding of Japan’s history and current diversity issues. I’m sure everyone learned a lot about the historical issues shaping Japan today. Our time here in Japan is running short, but visiting insightful sites like these makes me confident that we’ll be making the most of our time here. 3:45am on June 8, the day had finally come. Excited, I woke up two hours before the meeting time without any help from my many alarms, which is very unusual for me. We were saying our temporary goodbyes to Tokyo and heading to Kyoto, one of the prefectures on my Top 5 places to go see in Japan. We checked out of Sakura Hotel and took the shinkansen (bullet train) to the former capital with the use of our new Japan Rail passes, which allowed us to take unlimited rides on any JR transportation for a week. After approximately two hours, we arrived at Kyoto Station and met our tour guide for the day. We quickly checked into Ibis Hotel, dropped off our luggage and got onto the tour bus. First on our schedule was the Zen meditation at Kounji Temple, an unconventional “tourist” activity. It was a first experience for everyone. We were led by a scholarly monk who told us about the history of the temple and how it was supported by the local empress. He continued with teaching us the techniques for clearing our minds and meditating. We began our 15 minutes of silence, counting our exhales and inhales and drawing circles in our minds. Once the session was over, my legs were numb and I realized how hard it was to concentrate and think of nothing. I kept thinking about how the day was going to play out, financial issues, and of course I was worried about my research question. 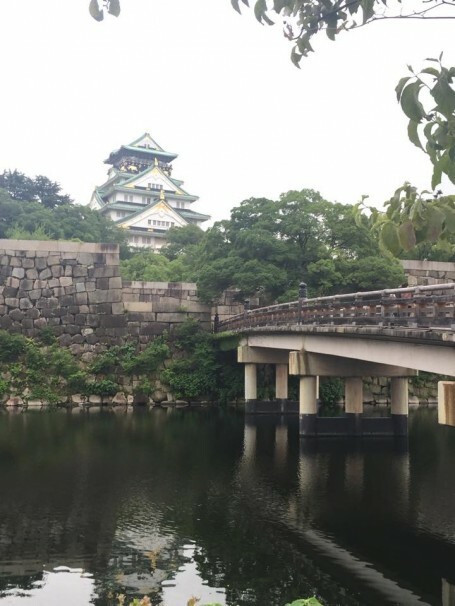 Although going to Kounji Temple (as well as seeing other sites such as Nijo Castle) was intriguing, I didn’t really see the connection to my research topic of the adaptations of Chinese food in Japan. 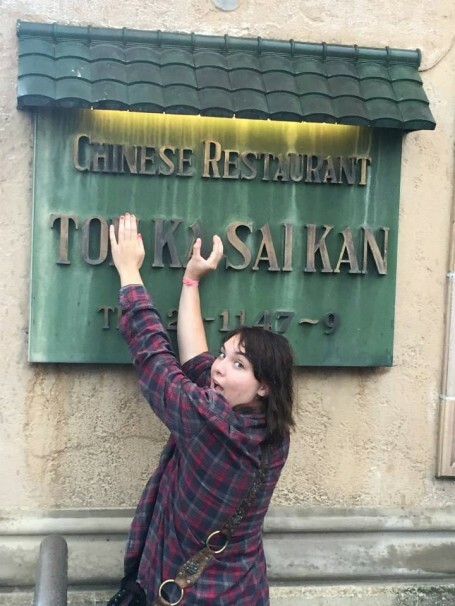 I thought the day was going to be empty of findings until we had dinner at Tokasaikan, a Chinese restaurant that our TA used to work at. We were fortunate enough to meet and talk to the manager of the restaurant, Mr. U Shuchu, whose grandfather came to Japan from Shandong, China about 90 years ago. His grandfather started the family business in Kyoto to avoid the competition of other Chinese immigrants who settled in the different Chinatowns of Japan. 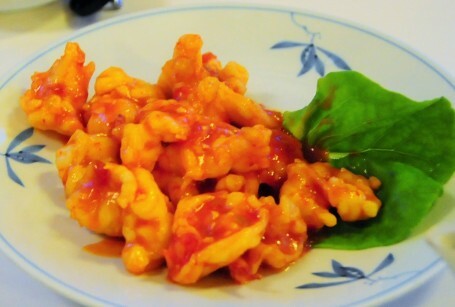 Although Mr. U stated that the restaurant serves “real mandarin style cuisines,” later he provided a more nuanced explanation of his restaurant’s food when I asked whether or not the dishes had changed over the past 90 years to accommodate for Japanese tastes. He did mention that he wanted to keep the food served as traditional as possible. 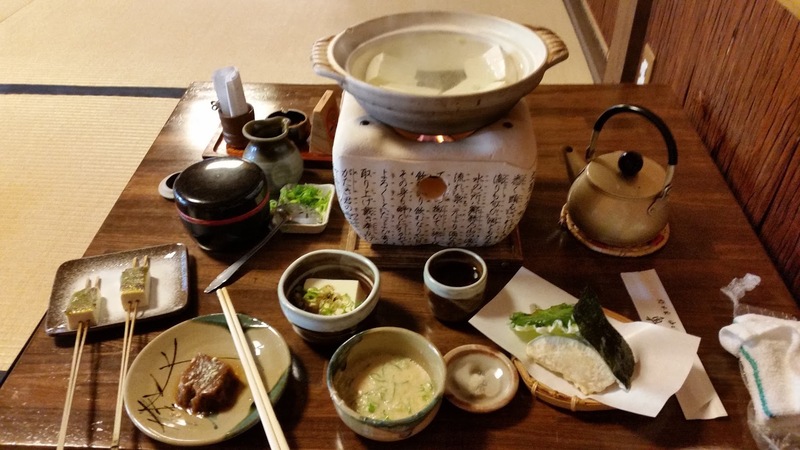 So although there have been changes such as having milder dishes and using Japanese soy sauce, he has the desire to preserve the traditional dishes as much as possible. 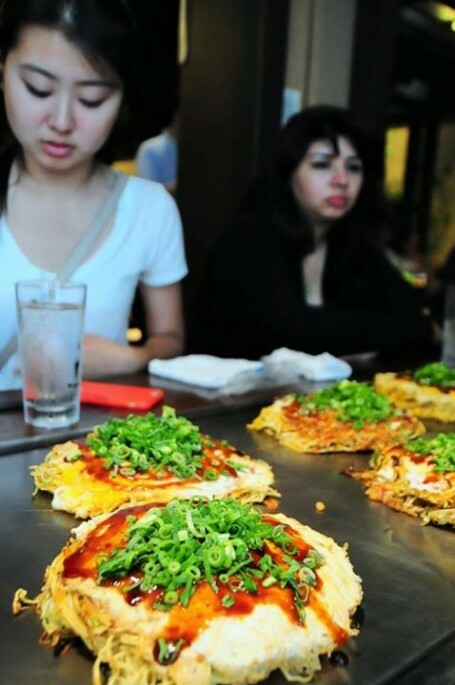 Despite this, the restaurant is more popular among Japanese than Chinese, but that may be because Japan is an ethnically homogeneous country with 98% being Japanese and 2% being all the other minorities. It was a great opportunity to be able to have a discussion with the manager about the food and then sampling some of the dishes right after. Getting to try the food for myself was a great hands-on experience. Many of the dishes we had such as the fried spring rolls and the fried rice tasted really similar to dishes I’ve had back home, but there were also some dishes I’ve never tried such as the shrimp with chili sauce. Even those dishes that tasted similar weren’t prepared exactly the same. The soup, for instance, was a different version from the ones in Los Angeles. This restaurant added in crab meat and blended the corn with the soup while the same soup back home had the actual corn pieces without the crab. I also noticed that a lot of the dishes had bamboo shoots in it, which isn’t as abundant in dishes from China or America. According to my observations bamboo shoots are used in many Japanese dishes such as ramen, yakitori, and bento boxes. Perhaps the addition of the bamboo shoots in many of the dishes was one adaption that he mentioned before our dinner. Even the dessert wasn’t what I think was traditionally Chinese. We were served fried mochi balls with red bean paste and powdered sugar. Although mochi with red bean paste is common, fried mochi is not familiar to me, let alone served with powdered sugar. 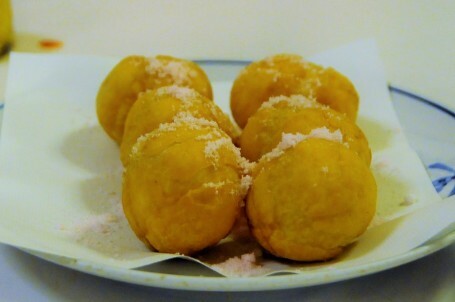 The Chinese mochi desserts I know are smaller and served with a sweetening soup, which sometimes include sesame seeds. It would be better to say that the dessert was a combination of mochi and a doughnut. The mix of both cultures within the dishes helps support the claim that the dominant culture, the Japanese culture, definitely has an affect on the minority cultures, in this case Chinese cuisine.